Thank you for your interest in Perios – The Elemental Quest. 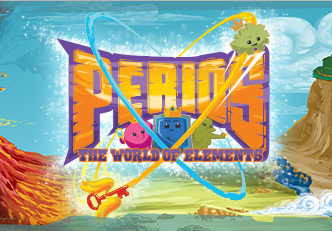 Perios is a concept game and exhibit series developed to teach children the basic building blocks of chemistry and have fun too. To do this, we have created interesting fictional characters called Perios, which are named for the elements in the Periodic Table. For example, Carbo, is named for Carbon. The characters have symbols, signs, traits, and powers that are similar to the elements they represent. The Perios belong to clans that match the vertical valence column "Group" of the Periodic Table. The clans live in different regions of the fictional Perioland. The Perios team is now offering world class learning exhibits and activities for science centers, children’s museums and schools. The Periodic Table of Elements is a difficult concept to introduce to young visitors while maintaining their interest. The Periosworld project offers a fun, entertaining, and creative presentation of fundamental concepts of chemistry. 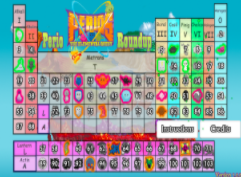 Perios activities are designed to provide a positive enjoyable learning experience with children’s initial introduction to the periodic table and the elements. 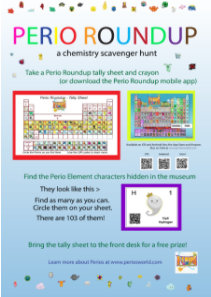 By having fun and becoming comfortable with seeing the Perios and the periodic table, students may be less intimidated with chemistry lessons when they are introduced at a later grade level. Our goal is for all children to know the Periodic Table of Elements when they finish grade school. 1. Hide the mini-Perio posters throughout your facility. 2. Give the students a Perio tally sheet and watch them have fun. 3. Stickers are awarded for participants. More if they complete the levels. 5. Use the mini-Perio posters as flash cards too!